(CNN) -- Minnows Burnley have become the smallest town to have a team in the English Premier League, after securing promotion by defeating Sheffield United 1-0 in the Championship play-off final at Wembley. Burnely players celebrate returning to the top flight of English football for the first time in 33 years. Wade Elliott's 13th-minute strike proved enough as Burnley, a north-west town of only 80,000 people, made their dreams come true in what is billed as the 'richest match in football' because of the potential rewards that come with playing in the Premier League. Burnley were one of the original 12 members of the Football League, when it was formed in 1888, and they will now be playing football in the top flight for the first time since relegation in 1976. The only goal was enough to grace any final, Elliott curling the ball home from the edge of the area in spectacular fashion. United, who still feel aggrieved at their relegation from the Premier League two years ago following the Carlos Tevez/West Ham transfer saga, finished the match with 10 men after young striker Jamie Ward was sent off for two handall offences. "We've got a great adventure to look forward to now, Burnley manager Owen Coyle told Sky Sports. "I think you've seen the effort the players gave, it was a great game, end-to-end -- and we had chances to put the game to bed. "We don't have quantity but I believe we have quality -- I'm obviously delighted with what we've achieved today. I'm immensely proud and delighted for everyone in the town -- but my heart goes out to Sheffield United," Coyle added. Goalscorer Elliott added: "I think it will take a little while for it to sink in, but I'm delighted for all the lads. It's far and away the best goal I'll ever score. "It fell nicely, I couldn't really strike it because it was turning a bit and it seemed to take a long time to go in. When it did I thought about running up to my mum and dad but they were in the opposite corner of the ground and it was so hot!" Sheffield United manager Kevin Blackwell added: "You've got to take it on the chin and move forward. 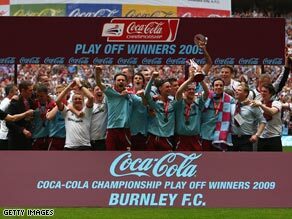 This is Burnley's day not ours. I can't complain. Our young lads came through and made a contest of it but it wasn't to be our day."